We're all hoping to have you back on Fanup man! Hide 203 comments... Click to show. There we go :D See you in LoL then! good luck on this weekly!! Hey! Welcome back mate :D btw i play Legaue of Legends too. In which server do you play? Good luck on the weeklys! Cool! You are finally back :) Hope you'll win the bids. Hey there, mate! What's new? Hmmm how explain u , Im French but I live in Germany, and I speak german too and u comes from Netherland right? I sent u a mail. Hello :), you need any help ? hmm, what happend when i wasnt so active? hey mate, how it going on?? its going great, and there? Kijk die koning zonder plaatje! finually found you when do we play a game? hey, Why wear the glaces worth 2k Fancoins and Ahola pants worth 1.5k FanCoins? I see them in "My stuff" but when i click on them, nothing happens. Please let me know. Haha thanks! a little bit late but okay. Already found my place in the leaderboard but can u accept my posts? thanks! Is het niet erg ofzeu? Awesome right? All you gotta do is fan stuff! Then log out/in and they should be there! So you dont know what updates is in gunz now right? Congratulations on the second place! Good job dude! 2nd place! I had to deduct FanCoins from your account due to the exploit. In the future please don't assume spamming a button is an ok way to make coins. ye i know that "are you serious" wasn't that helpful but the question was stupid , like who the hell doesn't know the pc requirements of farmville as if it has from the first place , and what do you mean by wanna ban competition? I guess talking IS fine with comments in accounts, but "chatting" would not. Cuz if it would be, why is there a chat box, right? it's a fine line, some people are talking in comments to obviously make coins. If it looks like someone is just spamming fake conversation then ya i'll say something, but it takes a lot to come to that. Well, I'm going to another country this week, so I need to get settled and stuff. Also downloading and gonna play APB, so I dont know if im going for 1st place. What are you talking about? Why do you keep tracking everything I do? uhm ja ik kan uploaden, jij niet dan? ikga weg hier niks werkt allemaal bugs en surveys die niet werken..
yo, weet jij wat je krijgt als je 1000 fanpoints hebt? Hey thanks how do you make your gcoins? wow van 1200 naar 2000 coins in een paar uur hoe doe je dat toch kan je me miss een paar tips geven? als ik iemand invite en op send invite click dan gebeurt er niks en heb ik nog steeds 20 invites over..
Hey, try not to spam (Write too many posts somewhere, like in someone's account.) And the Weekly Leaderboard ends every Sunday midnight PT. I'm glad I helped you out. However, keep in mind that not everything is in FanCoins/FanBucks. The idea of of FanUp was to create a best community site for online gamers. Content published on FanUp such as tips/cheats/guides/articles is reviewed at the end of the day by site moderators. You can't do any of those things right now. As of now, you can only use FanBucks to buy items from the FanUp Marketplace. Not sure if that will change in the future. There will be much more ways to spend your FanCoins in the future. 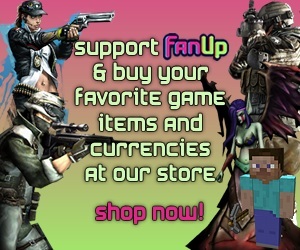 You cancurrently spend your FanCoins on various items for your personal FanUp avatar. Do as the romans do. You'll learn easier observing how others move across the site, so just watch the activity feed. Hello! Welcome to FanUp community!